Extinct dire wolf, Canis dirus. Image detail from a 1921 mural by Charles R. Knight (1974-1953). Image credit: From the Jesse Earl Hyde Collection, Case Western Reserve University (CWRU) Department of Geological Sciences. Made available through Wikimedia. Public domain. 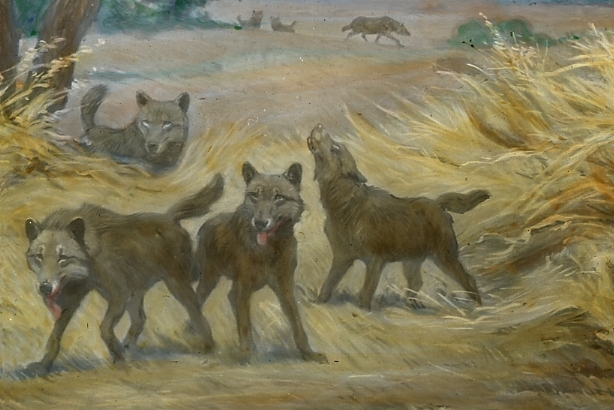 Evidence from La Brea suggests dire wolves lived in large groups. Many other dog-like carnivores lived during the dire wolf's time. Instances of co-evolvement proposed. Not a specialized predator--fed on abundant, large-bodied animals, and medium-to-large bodied hooved animals.